TGG’s MSO is a team primarily dedicated to providing managed services for CPM & EPM Solutions. Our team is based out of our Canadian head office at Yonge and Eglinton in Toronto, Ontario, and is available for on-site work if and when required. Our MSO Support model is adept to scaling with your business, offering access to skilled resources and the capability to ramp up during peak business periods and ratchet down during quieter periods. By design, our Associate Consultants know more about finding ways to mine greater value from your CPM & EPM platform. Exposure to multiple clients, industries and CPM & EPM tools gives them a diverse tool belt in servicing and enhancing your day to day functional and technical experience. They also do more than routine maintenance and administration, such as supporting our Solution Architects in the design and rollout of CPM & EPM solutions (e.g., Functional SG&A analysis extensions, automated cashflow analysis, value driver tree modelling, environment installation, patch assessment/implementation, hosting administration). Your CPM & EPM Platform is home to one of your most valuable information assets – financial data. Whether your requirements be functional or technical in nature, having a dedicated MSO team allows for optimal functionality and availability, enabling the business to prioritize value driven utilization of the solution. 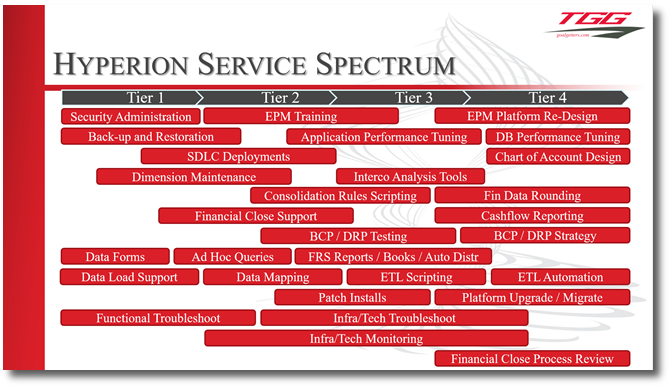 The TGG Support model assigns multiple Associate Consultants to each subscribing client, and they also have ready access to our entire TGG team from Senior Consultants to Solution Architects as well as access to senior Oracle engineers with whom we have forged a deep relationship with in our 20+ years of Hyperion experience. Together, we can offer the flexibility and focused expertise required to drive an efficient and robust CPM & EPM Solution.